BRECKINRIDGE, John Cabell, (grandson of John Breckinridge, father of Clifton Rodes Breckinridge, and cousin of Henry Donnel Foster), a Representative and a Senator from Kentucky and a Vice President of the United States; born at ‘Cabell’s Dale,’ near Lexington, Ky., January 16, 1821; attended Pisgah Academy, Woodford County, Ky.; graduated from Centre College, Danville, Ky., in 1839; later attended the College of New Jersey (now Princeton University); studied law in the Transylvania Institute, Lexington, Ky.; admitted to the bar in 1840; moved to Burlington, Iowa, but soon returned and began practice in Lexington, Ky.; major of the Third Kentucky Volunteers during the Mexican-American War in 1847 and 1848; member, State house of representatives 1849; elected as a Democrat to the Thirty-second and Thirty-third Congresses (March 4, 1851-March 3, 1855); was not a candidate for renomination in 1854; was tendered the mission to Spain by President Franklin Pierce, but declined; elected Vice President of the United States in 1856 on the Democratic ticket with James Buchanan as President; unsuccessful candidate for President in 1860; elected to the United States Senate and served from March 4, 1861, until expelled by resolution of December 4, 1861, for support of the rebellion; entered the Confederate Army during the Civil War as brigadier general and soon became a major general; Secretary of War in the Cabinet of the Confederate States from January until April 1865; resided in Europe until 1868; returned to Lexington, Ky., and resumed the practice of law; vice president of the Elizabethtown, Lexington Big Sandy Railroad Co.; died in Lexington, Ky., May 17, 1875; interment in Lexington Cemetery. Recommended Reading: Breckinridge: Statesman, Soldier, Symbol (Southern Biography Series) (Paperback, 688 pages). Description: William C. Davis has written the only full-length biography of John C. Breckinridge, who is one of the most fascinating and yet one of the least known figures in all of American history. 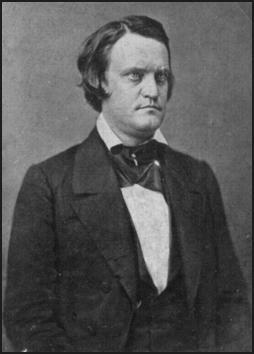 Davis begins by charting Breckinridge's early years as a lawyer, his rise in Kentucky state politics and then national politics, his role as Vice-President and his reluctant campaign for the Presidency in 1860. Davis then provides an excellent overview of Breckinridge's career as a Confederate military leader, fighting on nearly every front of the war and ending the war as the Confederate Secretary of State. Continued below. Davis also gives an outstanding account of Breckinridge's dramatic escape from the country following the Confederate defeat, which was an adventure so extraordinary that it should be made into a movie. Davis concludes his work by describing Breckinridge's years as an exile before his final return to Kentucky and his tragic early death. Davis is one of the nation’s most respected Civil War historians, and this book is an excellent manifestation of his scholarly and literary gifts. Not only is it full of information, allowing the reader to truly feel as though they have a solid understanding of Breckinridge's life, but it is written in such a fine style that it is always entertaining and never dull. Recommended Reading: Generals in Gray Lives of the Confederate Commanders. Description: When Generals in Gray was published in 1959, scholars and critics immediately hailed it as one of the few indispensable books on the American Civil War. Historian Stanley Horn, for example, wrote, "It is difficult for a reviewer to restrain his enthusiasm in recommending a monumental book of this high quality and value." Here at last is the paperback edition of Ezra J. Warner’s magnum opus with its concise, detailed biographical sketches and—in an amazing feat of research—photographs of all 425 Confederate generals. Continued below.. The biographical entries include complete names, birthplaces, important relatives, education, vocations, publications, military grades, wartime assignments, wounds, captures, exchanges, paroles, honors, and place of death and interment. In addition to its main component, the biographies, the volume also includes a number of essays, tables, and synopses designed to clarify previously obscure matters such as the definition of grades and ranks; the difference between commissions in regular, provisional, volunteer, and militia services; the chronology of military laws and executive decisions before, during, and after the war; and the geographical breakdown of command structures. The book is illustrated with 84 new diagrams of all the insignias used throughout the war and with 129 portraits of the most important high commanders. Bibliography: Official Records of the Union and Confederate Armies; American National Biography; Dictionary of American Biography; Davis, William. John C. Breckinridge: Statesman, Soldier, Symbol. Baton Rouge: Louisiana State University Press, 1974; Heck, Frank. Proud Kentuckian, John C. Breckinridge, 1821-1875. Lexington: University Press of Kentucky, 1976; Library of Congress; National Park Service; National Archives and Records Administration; Memoirs of William Williams Stringfield, 1901.